Information is updated monthly and is typically one month in arrears. 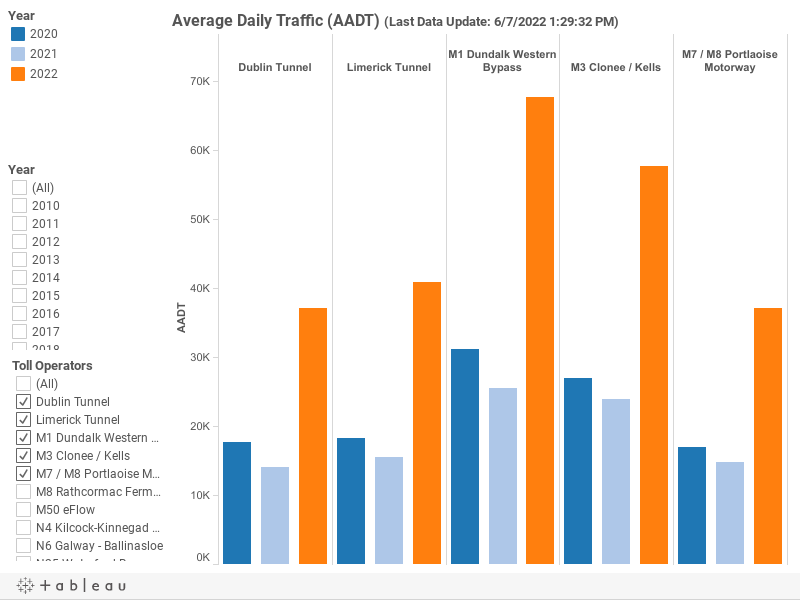 The bar-chart below illustrates the average daily traffic for each toll plaza in Ireland from 2010 onwards. Information is updated monthly and is typically one month in arrears. Given seasonal travel trends it should be noted that the Average Daily Traffic for the current year will fluctuate until the full year's data is available. To see additional information about our traffic counters and related information visit our Traffic Count Data page. The contents of these pages are provided as an information guide only. They are intended to enhance public access to information about TII. While every effort is made in preparing material for publication no responsibility is accepted by or on behalf of TII for any errors, omissions or misleading statements on these pages or any site to which these pages connect. Although every effort is made to ensure the reliability of listed sites this cannot be taken as an endorsement of these sites.